We have discovered dolls, ayayayay! It’s adds a whole other dimension to play. Not to mention tons of stuff to buy and store. Its all so commercialized nowadays that I'm ambivalent about doll playing, though this article explains it’s a good thing. 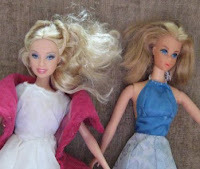 To test how much she really wanted to play with dolls, I took out my old Barbie dolls. We're talking 30 yr old Barbie dolls. Amazingly I still have them! So I took them out, looked at all the beat up clothes and dolls, did my best to clean them, and let her play a bit. OUR babrbie dolls, not only yours, hehehehe.....enjoy!!! OK OK, we did share them... but they're mine now, bwahahaha! Even Dancin' Barbie and the vintage Barbie wedding dress we got from Lisi!